Mark and I are moving towards a renovation of our “Florida room.” A Florida room, for those who are not familiar, is somewhere between a screened-in porch and a sun room. Our version includes jalousie windows (which we thought we had left behind in Hawaii) and the remnants of what was once an outdoor kitchen complete with electric stove. Other “highlights” include carpet not actually nailed to the ground and an under 8′ ceiling with some old ceiling fans. 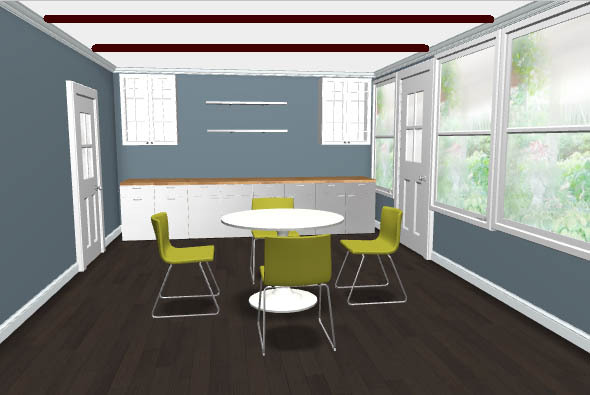 I’ll have “before” pictures shortly, but this post is about utilizing some free online design software I found to help me get an idea of what we could do with the space. Since the room was an add-on to the original house sometime during the 70’s we think, it runs the length of the house but isn’t all that wide, about 12′ x 30′. The shot above only shows about half of the room. The other side will feature a sitting area with chairs and/or chaise and as much as I wish you could add any of IKEA’s products to my room, it is limited to only kitchen and dining related items. What I liked about using this software (apart from the fact that it was free and easy to use) was that I could play around with wall color as well as different materials for the floors, counters, etc. We don’t plan on having green, modern-looking chairs in our sun room, but I was thinking about a green rug under white/light club chairs on the other side so it was nice to be able to introduce the color and see if it “played nicely” with the other things I had going on in the room. I wished I could have added a rug under the table, but I think a caramel colored indoor/outdoor sisal will work well and tie in with the warm oak butcher block counter top I selected. Pretty cool huh? Of course, I would like to add a blacksplash (something like this) but I think this gives me a good idea of what it would look like with the same floor and wall colors that I chose for the sun room. I really liked playing around with this program. I thought it was a great way to see how the colors and other choices I was mulling over in my head looked on paper screen. 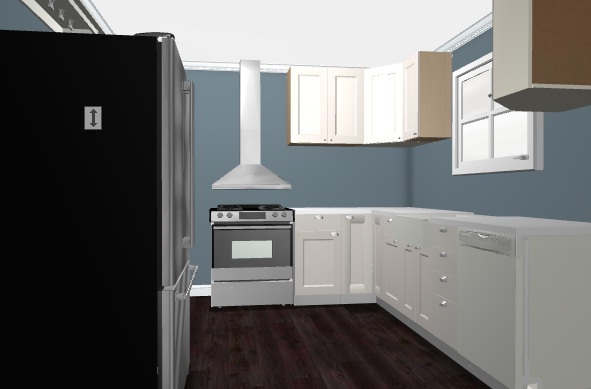 Now my question is how the dark blue/grey color that I selected for the kitchen and sun room walls will go with the other blue colors I have on the walls in the family/dining room? So next I am going to play around with FloorPlanner, another free design software that will allow me to make 2D floor plans. This will allow me to not only see the colors all in one view, but also play around with furniture configuration. Stay tuned!